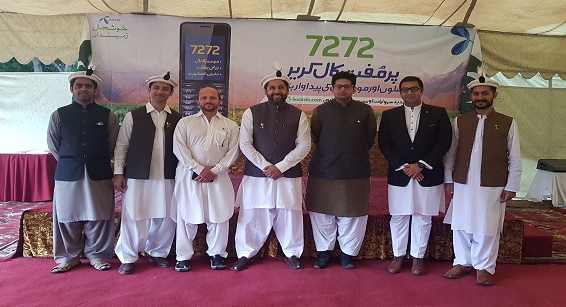 Expanding its digital footprint to the far-flung and underserved areas of the country, Pakistan’s premier telecom and digital services provider, Telenor Pakistan has launched its mobile agriculture advisory service ‘Khushaal Zamindaar’ in Gilgit – Baltistan. Launched in collaboration with Market Development Facility (MDF), the innovative service will provide localized and customized advisory services to facilitate local farmers in increasing their agricultural yield. Telenor Pakistan Set to Galvanize Agricultural Growth in Gilgit Baltistan via Digital Innovation. The high-spirited launch event was held in a local hotel in the provincial capital, Gilgit. The honorable guests include MDF, members from Agha Khan Rural Support Program (AKRSP), Japan Inter Cooperation Agency (JICA), International Fund for Agricultural Development (IFAD), media persons, community leaders, female farmers of Gilgit and Telenor Pakistan officials. ‘Khushaal Zamindaar’ is Telenor Pakistan’s innovative and industry-first initiative, initially launched in Punjab to help small scale farmers into adopting modern and best practices in agriculture. It provides localized, contextualized and customized information including weather forecasts, timely agronomic & livestock advisory through SMS and robo calls to help increase crop yield, reduce post-harvest losses, safeguard nutrition and better manage adverse climatic effects and natural resources. Currently, more than 04 million small scale farmers subscribe to this free of cost service covering a range of cash crops, fruits and vegetables, fodders and livestock and 20 percent of them are women farmers.